Home Photo Studio: a powerful and easy photo editing software with a complete set of image manipulation tools. Thanks to a convenient interface and a detailed help system, the software is simple to learn but provides enough options to keep any photo enthusiast creatively occupied. It allows you to enhance your photos, add beautiful effects, decorate images with artistic borders and frames, create greeting cards and collages! You can add special effects to your photos, including lighting, weather effects, and even 3D composition - a feature not commonly found on non-professional photo editing software. Frames in a wide range of styles can be added to the photos, as well. When the photos have been enhanced, they can be used to create slide shows, postcards, and collages, which can be shared with others. 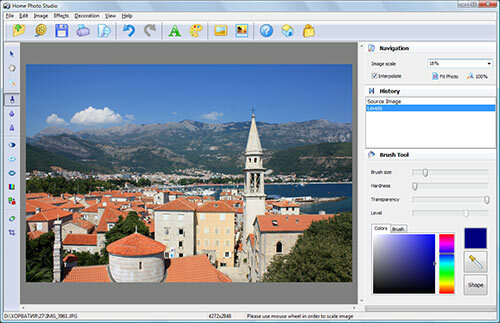 Home Photo Studio software includes hundreds of special effects, design templates, and project options that can be used with digital photos on computers. If mistakes are made during the editing or enhancing process, the multi-undo feature makes correcting the error easier. Help you fix color problems and technical defects, resize, crop and add effects. We work hard so you can have more time for taking your photos! Qweas is providing links to Home Photo Studio 3.0 as a courtesy, and makes no representations regarding Home Photo Studio or any other applications or any information related thereto. Any questions, complaints or claims regarding this application Home Photo Studio 3.0 must be directed to the appropriate software vendor. You may click the publisher link of Home Photo Studio on the top of this page to get more details about the vendor.